DEPEW RESIDENT WINS NEW CAR! Donate A Toy And You Could Win A Car! Welcome to Operation Santa Claus 2011! This holiday season, The Basil Family of Dealerships, Entercom Broadcasting, WKBW Television and Toys for Tots teamed up once again to provide toys for children who might otherwise not receive anything for Christmas. Operation Santa Claus has contributed over 40,000 toys since its inception in 2004. 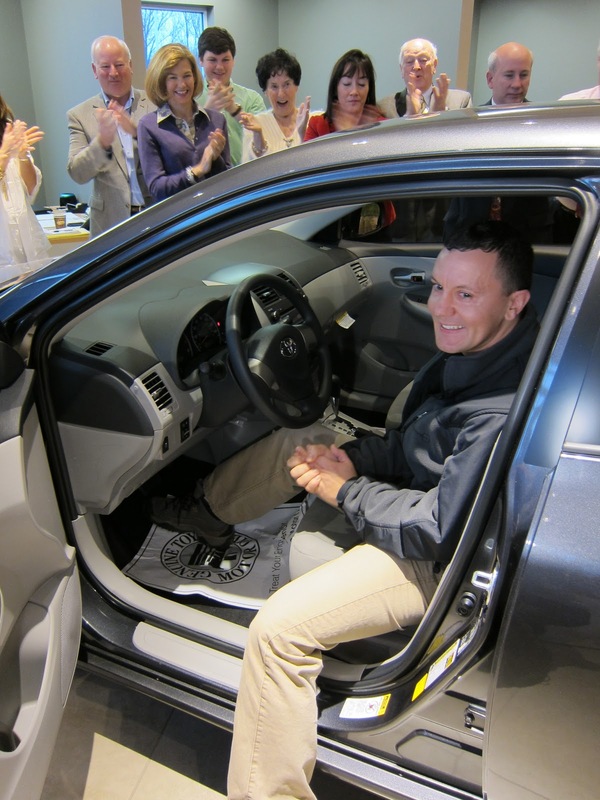 Participants entered to win a brand new vehicle just for making a donation. 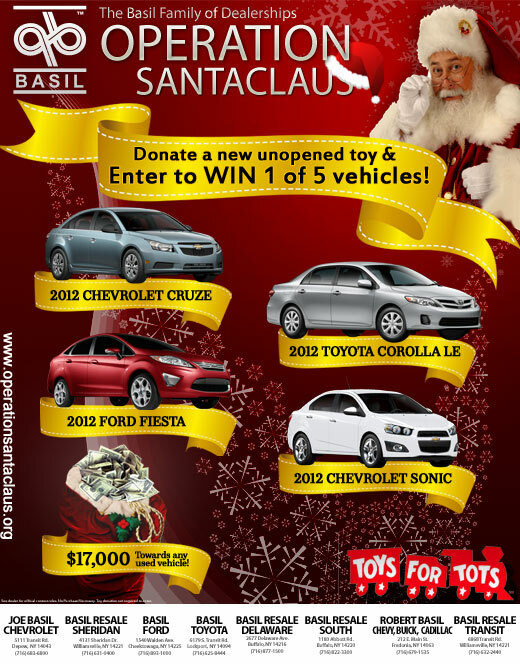 Over 5,000 Western New Yorkers donated toys and entered to win their choice of a new 2012 Ford Fiesta, 2012 Chevy Cruze, 2012 Chevy Sonic, 2012 Toyota Corolla or $17,000 in Basil Bucks toward the purchase of any pre-owned vehicle from the Basil Resale Centers. Donations and entry forms were accepted at all eight Basil locations: Basil Toyota in Lockport, Basil Resale Sheridan & Basil Resale Transit in Williamsville, Joe Basil Chevrolet in Depew, Robert Basil Chevy Buick Cadillac in Fredonia, Basil Ford in Cheektowaga and Basil Resale South & Basil Resale Delaware in Buffalo. selected keys, hoping they chose the one that would start the contest vehicle. One by one, they got into the vehicle parked in Basil Toyota's brand new showroom. The fourth contestant, Ken Tys from Depew, turned his key and was the lucky winner! Luck is no stranger to the Tys Family. Back in 2005, Ken's mother, Irene Tys, was the Operation Santa Claus car winner. Joe Basil, Sr. expressed his gratitude, "For well over 58 years, Western New York has supported the Basil Family and we want to thank everyone and give back to our community as much as we can. Thank you." "Operation Santa Claus" is underway! Jon Summers from Channel 7's "AM/Buffalo" visited a local Basil dealership recently to tell you how making a donation of a new or unwrapped toy this Christmas could get you a new set of wheels! You can enter to win at any Basil dealership through Monday. Watch for the LIVE car drawing Wednesday December 21st at 10am on "AM/Buffalo"
Toys donated will be distributed through the Toys For Tots campaign. AMHERST, NY ( WKBW ) It's called "Operation Santa Claus"...where Western New Yorkers are asked to help the jolly old man himself by donating a new or unwrapped toy at any Toys R' Us, or Basil family of dealerships location. Today, the Channel 7 day of donations kicked off at the Toys R' Us store at 3030 Sheridan Drive in Amherst. 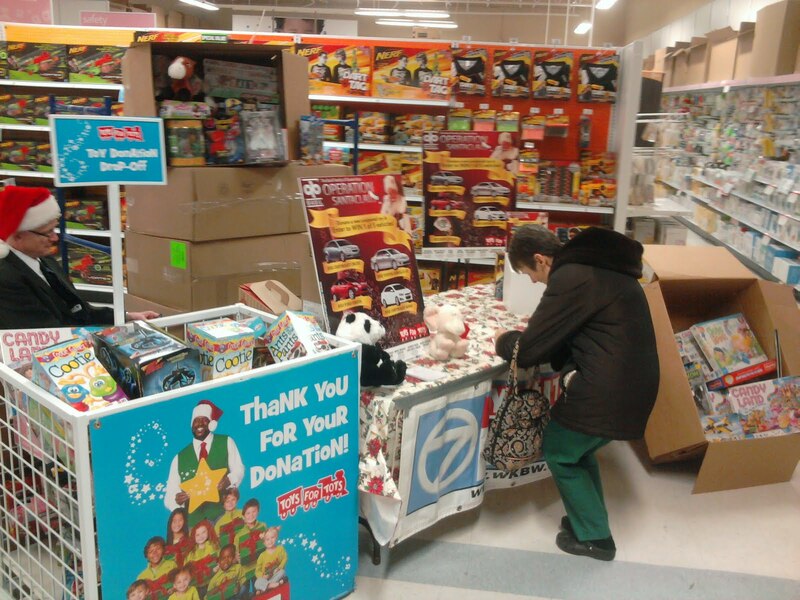 WKBW Channel 7 is a proud partner with Basil, along with the Marine Corps Toys For Tots campaign. The toys collected will be distributed to needy children and families in Western New York this Christmas. In addition to the toy donations, you can also enter to win a new car! There is no purchase necessary, and you can enter at the Toys R' Us store, or any Basil dealer. Get more information at operationsantaclaus.com...then watch for the LIVE drawing for the new car Wednesday December 21st on Channel 7's AM/Buffalo at 10am. Join us today at Toys-R-Us located at 3030 Sheridan Drive in Amherst, NY! Live with Channel 7 WKBW. Drop off a toy for Toys-For-Tots and enter for a chance to win 1 of 5 brand new vehicles or $17,000 towards any used vehicle from one of our resale centers!